Following a clear and compact introduction, Wagner’s opening chapter relates the background and events of the fall of Srebrenica and the genocide—Europe’s first since WWII—that ensued. Though her emphasis on the shared culpability of the “international community” (in the guise of the UN) is helpful for understanding postwar developments, there is little to distinguish Wagner’s able retelling from histories and journalistic accounts—which she handily reviews in a few pages—already available; thus those familiar with the history may skip ahead to subsequent chapters. In brief: from 1992 on, as Bosnian Serb forces “ethnically cleansed” eastern Bosnia of its non-Serb population, Srebrenica became a rare place of refuge for Bosniaks (Bosnian Muslims) from surrounding areas. It was declared a UN “safe area” in the spring of 1993, and its population eked out an existence, sustained by UN aid convoys and protected (ostensibly) by a small, lightly armed unit of Dutch soldiers, until July 1995. In July’s opening days, Bosnian Serb forces, led by General Ratko Mladić—now, following Radovan Karadžić’s capture in July 2008, the last remaining major fugitive from the war crimes court in the Hague—tested the UN’s resolve by taking control of key UN peacekeeping positions in the mountains around Srebrenica. Threatened NATO airstrikes never came, and so on July 11th Mladić and his forces entered the town. Most of its population had fled to the Dutch headquarters (“Dutchbat”) in the nearby village of Potočari; some men decided to walk through heavily mined forests toward Tuzla (a harrowing trek that would come to be known as the “March of Death”). At Potočari the Dutch soldiers allowed (and even assisted) Mladić—who promised that no one would be harmed—to separate males, including children and old men, from females, and to send the former away on buses. While the women and girls were bused to Bosniak-controlled territory and released, over the following days the men were taken to nearby fields and warehouses and executed—by the hundreds, by the thousands—in a carefully planned and coordinated action. Many of the men fleeing through the woods to Tuzla were likewise captured and killed. The bodies were subsequently buried in mass graves. 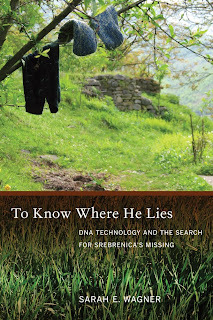 The remainder of the book, after a chapter introducing the “people and place of postwar Srebrenica,” focuses on describing the development, implementation, and implications of this “counterpoint” technology, assessing its efficacy both as a technical instrument of identification and as a sociopolitical instrument of post-conflict social repair. The succession of chapters follows the journey of the missing through the entire process, from the technological and forensic work conducted at graves and in labs, to the visits of “case managers” to individual families to gather information and confirm identification, to, finally, the collective burials of newly identified remains, held annually on July 11 at the Srebrenica-Potočari memorial center, completed in 2003 on the former site of the Dutchbat compound. Ethnographic vignettes, clear explanations of technical procedures, and telling (and often moving) details consistently demonstrate the remarkable thoroughness of Wagner’s fieldwork, her mastery of Bosnia’s difficult Slavic language (Bosnian/Croatian/Serbian, or BCS), and the intimacy of her access to the social interactions and entanglements generated by the identification process. This level of access, in turn, testifies to the sensitivity and care by which she earned the friendship and trust of her interlocutors. She lived for months in Srebrenica, getting to know members of “Women of Srebrenica,” a support and advocacy organization for the thousands who lost husbands, sons, and brothers; she interned at the ICMP offices and laboratories in Tuzla, learning the technical ins-and-outs of the new DNA science; and—most strikingly—she accompanied case managers on their visits to families of the missing, observing extraordinary, and often shattering, moments of grief as women signed off on papers confirming the identification of their sons’ or husbands’ mortal remains. The missing, and the process of their identification, mean different things—and are manipulated in different ways, to different ends—for the range of stakeholders in Bosnia. For the scientists of the ICMP, Wagner observes, the missing are scientific and technical problems to be resolved; for Bosniak nationalist politicians and religious leaders, they are emblems of collective victimhood, proofs of who bears greatest guilt for the social and material devastation wrought by the war; and to Bosnia’s international overseers and humanitarian workers, their identification represents the possibility—the limits of which Wagner has so powerfully evoked—of “sociopolitical repair” and reconciliation (8). In her chapters on the annual memorial ceremony and collective burial at Potočari, Wagner discusses the oft-noted manipulation of Srebrenica for political gain by Bosniak nationalists, and points out the unintended consequences of the identification and reburial process, which include deepening divisions between Bosniak and Serb communities, especially in eastern Bosnia, where Serbs have constructed their own counter-memorials and begun to conduct counter-ceremonies for their own war victims on July 12. This is (to say the least) a troubling outcome, as it reinforces Bosnia’s entrenched, stagnating politics of competing victim claims and unresolved wartime grievances; and Wagner, noticeably, does not venture ideas or suggestions about how the process could be otherwise implemented to lessen divisive ramifications. This omission, perhaps, along with her reluctance to dwell on nationalist manipulations and maneuverings, is made in favor of emphasizing the personal meanings and effects of the Potočari ceremonies for the families of the missing. Yes, says Wagner, the missing, especially via the annual burials, are slotted into different collective categories, to different (and sometimes lamentable) strategic ends; but the individual experiences of the bereaved families, the importance of the ceremonies for their own processes of grief and going-on, consistently exceed and escape, cannot be encompassed by, these collective movements, and deserve as much or more emphasis in any account. Peter Locke (plocke@princeton.edu) is a doctoral student in cultural anthropology at Princeton University. His dissertation examines trauma and psychosocial services in postwar Sarajevo, Bosnia-Herzegovina.